Experience the evocative sounds of a significant number of Australia's bird species. Many of these birds have melodious songs and others have very interesting and unusual sounds. This selection of 57 species includes many that are well known such as Laughing Kookaburra, Superb Lyrebird, Australian Magpie, Willie Wagtail and Galah as well as the infrequently heard Emu. Others, including Crested Bellbird, Chiming Wedgebill and the rare Noisy Scrub-bird, live in remote places and their crystal clear melodious songs are most enjoyable. This album features no music or spoken commentary. The natural calls of the birds featured can be appreciated as a continuous revelry of bush sounds. For those interested to know the identity of the bird calling, the album is indexed. Information on species identification can be found inside the cover. 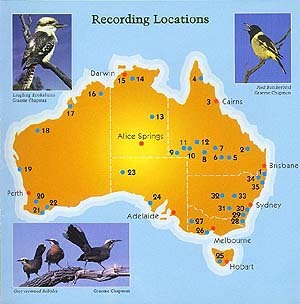 A map of Australia is included in the cover and the locality of each recording is provided. The numbers on the map can be cross referenced to the track list to allow the listener to know where the recording was taken (see below). 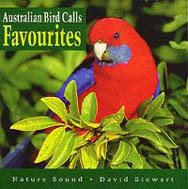 Birds Australia, the largest bird organisation in the country, endorses and recommends this CD to anybody interested to hear a range of calls of Australia's wonderful birds.